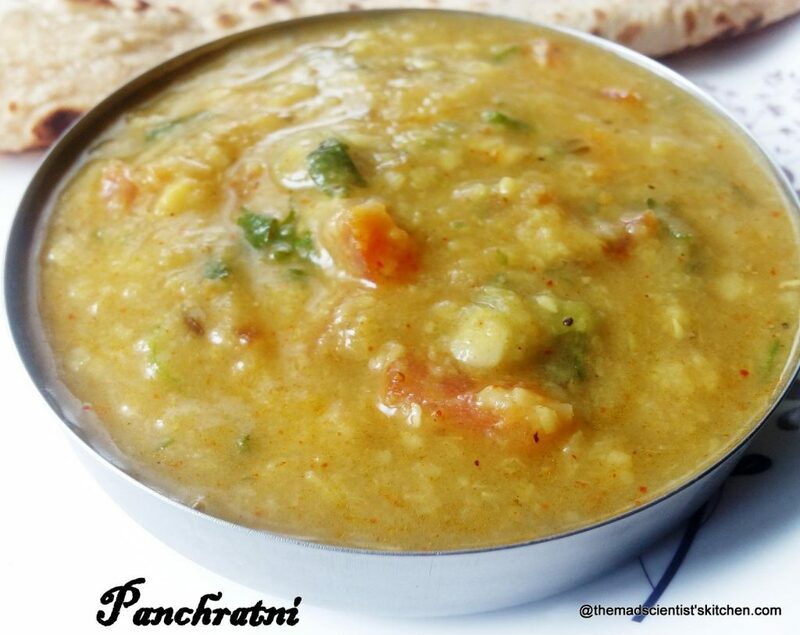 Panchmel dal is a combination of 5 lentils toor dal, chana dal, moong dal, masoor dal and urid dal. Yet cooking the Panchratni, as it is also called is very simple. The delicious preparation is tempered with homemade ghee. What more do you want for your protein fill? The origins of the dal are very vague and may be a topic of debate. 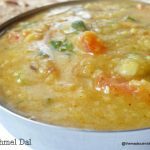 Apparently, the Mighty Bhim, of the Pandava fame, created the first panchratna dal by slow cooking the mix of five dals in an earthen pot and garnishing it with a generous dollop of ghee. The other legend is that Jodha Bai from the royal Mewar Family successfully introduced Panchmel dal to the Mughal Kitchen. Food historians also believe that the panchmel dal may have been born out of the necessity to create a different tasting dal for the royal meal every day – changing the combinations of dal and the tempering ensured that the dal tasted different every time! Whatever the origin enjoy this delicious dal. I had it with rotis but I am sure it will taste great with Jeera Rice. 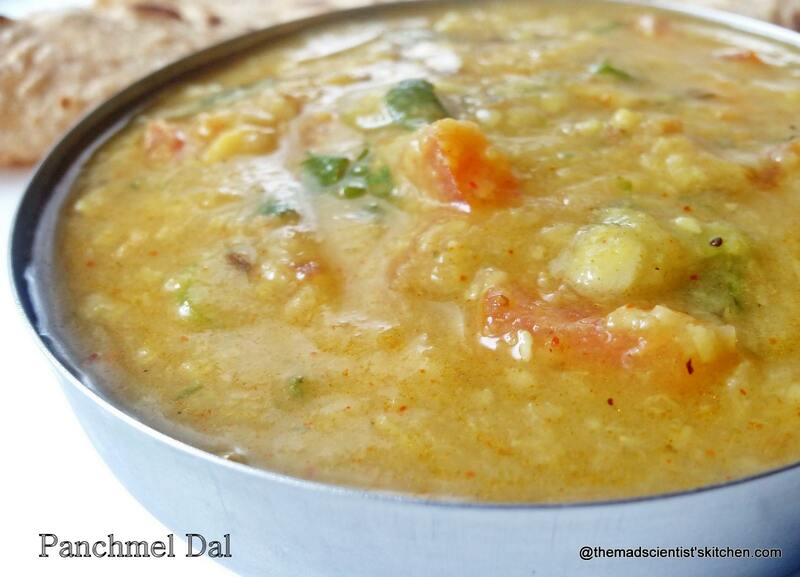 Dal or Daal has a place of pride in an Indian meal. Whether you know it or not you are being fed dal in some form or other like Vegetables with Dal, Ridge Gourd and Masoor Dal Vegetable, Simple Paratha with Leftover Moong Dal to name a few. The main ingredients in Panchmeal Dal or Panchratni are toor dal, chana dal, moong dal, masoor dal and urid dal, ghee, jeera or cumin seeds. A delicious mixture of lentils that is simple to make but gives you your quota of protein in a bowl. Wash and rinse all the dals in a big bowl. Soak together for 1 hour in hot water.I soaked them in the pressure cooker I was planning to use to pressure cook the dal. Add some water and cook in the pressure cooker for 4-5 whistles. (My rough method for water is when I stand my index finger on the dal the water should reach my finger joint dipped in water). Once the cooker is open use the ladle and mash the dal properly. Add more water say about a cup and mix properly. In a small kadhai/wok heat the ghee and oil. Add hing, jeera seeds, garam masala. The jeera will splutter immediately add to the dal in the cooker. Add turmeric powder, chilli powder, coriander powder and salt to taste, add water to adjust the consistency. Add salt and chopped green chillies, tomatoes and coriander leaves. Serve the Panchmel dal with roti, jeera rice or plain steamed rice. To make Jeera Rice follow the link. This daal is a mix of daals and I sometimes add two three more daals to make it eight or navratan daal . Now my brother has made a joke out of it ..he says she doesn’t have enough daals so uses the bits from all jars ! But seriously mixing daals gives a wonderful flavour and I like this panchratni daal that you have cooked . I am big fan of this panch mel dal. Love it to the core. I use moth beans too in this. I love that vibrant yellow color that you have got. So many dal in a single dish.. Must be really delicious and healthy of course.. Yes this is one easy one to make and enjoy too..I can never tire with the dals we have! My family loves panchmel dal. Nice historian thoughts on how this dal may have originated. Panchmel dal is my favourite. It looks so comforting and very delicious. I use different dals when I am low on provision. And guess that is what happens in many homes. The mix of dals have a mixed flavour which is so good. Perfect with rice and ghee. It would make a great comfort food. Mix of dals makes an extremely fingerlooking goodness dal definitely. Panchmel dal makes an excellent protein rich dish. Prefect comforting dal to have with some rice. The mix of dals has a very different taste. Though I have prepared this recipe I havent yet posted this in my blog.